It’s true that you can use your iPad instead of your Mac to take care of many common computing tasks. But unless you’re ready to ditch Mac OS X entirely, you’ll still need to transfer files back and forth between your iPad and your Mac if you’re going to get work done. Unfortunately, transferring and synchronizing files between the Mac and the tablet isn’t easy. There are several different ways to do it, but none are perfect, and each has its deficiencies. Frankly, this is one area where Apple could vastly improve the iPad experience. Until that happens, here are your choices when it comes to transferring files between your various devices. Apple’s officially endorsed route for file-transfers between iPad and Mac is via iTunes file-sharing. Unfortunately, it’s an amazingly clunky process. For one thing, it only works with apps that support it. All of Apple’s iPad creation tools—Pages, Keynote, Numbers, GarageBand, and iMovie—use iTunes to move files back and forth. Some third-party apps—e-readers, text editors, and media creation tools—do too. But even then, different apps use iTunes in different ways: Apple’s apps, for example, require you to select Save to iTunes when saving a document; other apps make their files available to iTunes automatically. Worse, though, is the constant manual effort required to keep files in sync. By now, you probably know the routine: Connect your iPad directly to your Mac and open iTunes. Select your iPad in the iTunes source list and click on the Apps tab. Scroll down past the list of installed apps and look for the File Sharing section. Tap the app you want to copy a file from, so its files appear in the Documents pane. Drag one or more of those files to the Desktop (while holding down Option key) to copy them there, or use the Save To button to open a traditional save dialog. If you update a file on your Mac and want to send it back to the iPad, you must then drag that changed file back into iTunes, onto the correct app’s document list again. I have yet to find any solution—an AppleScript, an Automator workflow, a third-party utility—that makes this process any easier. For that reason, I use iTunes file-sharing as an extra backup for lengthy Pages documents and GarageBand projects, but for little else. The workflow required to work on a single file from both your Mac and your iPad is simply too awkward for more frequent use. When I think about file synchronization, I immediately think of Dropbox ( ) (free for 2GB). The service is great at keeping files in sync between my computers. So how does it fare at syncing files between Macs and iPads? The iPad Dropbox app gives you access to your synchronized files, but no way to save edits you make on your tablet. Unfortunately, Dropbox on the iPad is merely adequate—but not through any fault of its own. The Dropbox app, like numerous other cloud storage services (including MobileMe iDisk), offers an easy way to access any files and folders you store with the service. Dropbox’s app makes it a cinch to view any data that’s in iOS-friendly formats, including Word and Pages documents, PDFs, text files, and images. Even better, Dropbox and others like it offer you the option of opening your synced files in their compatible iPad apps; you can, for example, use the Dropbox app to send a word-processing document to Pages. The flaw in this process is that there’s no way to send the updated file back to Dropbox again from within Pages again. Because of limitations in how iOS currently operates, cloud-storage apps are a one-way street on the iPad. It’s simple to get files from Dropbox into an app, but you can’t send them back to Dropbox when you’re done. There is one sort-of workaround. In apps that support WebDAV–such as Pages—you can use DropDAV ($5 per month) to access your Dropbox folder. DropDAV lets you interact with your Dropbox files via a traditional WebDAV connection. Since Pages lets you open files from a remote WebDAV server, you can get your document and edit it on your tablet. Just remember that you’re working on a local copy. When you’re ready to save, you must manually publish your document back to the DropDAV-created WebDAV server. It’s definitely the easiest way to approximate the Dropbox Mac experience on your iPad, but it’s still far from seamless. There are some iPad apps that have built-in support for cloud storage (most commonly Dropbox). In fact, Dropbox’s Website lists more than 130 apps that integrate with the service in some way. There’s a slew of Dropbox-compatible iPad text editors, for example, including Elements ( ) ($5), iA Writer ( ) ($1), and Textastic ($10). With those editors, syncing feels seamless; your changes save directly into Dropbox; changes you make on your Mac are picked up almost immediately on your iPad. There’s no need to connect your iPad to your Mac; the process feels effortless. 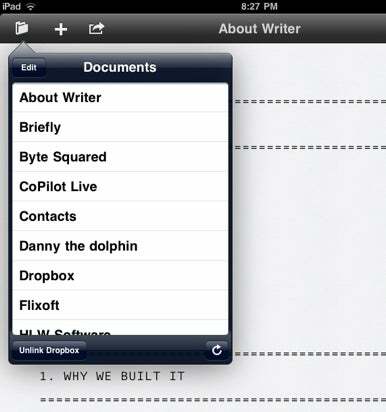 Some iPad text editors, such as iA Writer, will you let you save files directly to Dropbox. Besides text editors, the list of Dropbox-compatible apps includes full-fledged word processors such as DocumentsToGo ( ) ($17), QuickOffice ( ) ($15), and Office2 ( ) ($6); file readers like ReaddleDocs ( ) ($5) and GoodReader ( ) ($5); audio note apps like DropVox ($1), Audio Memos ($1), Mobile Recorder ($1), and Smart Recorder ($3), and many more. When apps let you open and save documents directly from and to Dropbox, sane file management becomes painless. Apple’s iPad apps don’t integrate with Dropbox, but they do work with MobileMe iDisk. Unfortunately, their integration with it isn’t nearly as smooth as you get with the best of the Dropbox apps. Publishing to iDisk is too much like iTunes File Sharing; you’re copying your file to the remote server, instead of maintaining a single, always-in-sync version. But what Apple’s iWork suite lacks in syncing quality, it attempts to make up for in the number of ways you can sync: Besides iDisk, you can share iWork documents via iWork.com, send them to iTunes, or copy them via WebDAV. None of those options matches the simplicity of the Dropbox-enabled apps I’ve used. The DropDAV service mentioned earlier helps a bit, but lacks all the niceties that true Dropbox integration can offer. Unless and until Apple and other vendors build full two-way sync into their apps, the next best thing is e-mail. E-mail, of course, is no closer to true realtime synchronizing than iTunes File Sharing; you’re still sending copies of your file back and forth, and you have to be careful that you’re always working on the latest version. But e-mailing offers a couple distinct advantages over the iTunes model. First, you don’t have to connect your iPad to your Mac. Second, e-mails include date-stamps, so you don’t need to guess whether you’re working with the most recent version of a file; you can see precisely when you sent it to yourself. If you plan to rely on e-mail file transfers a lot, it may be worth creating special rules in your mail client of choice to handle these special messages. For example, in Gmail I created a filter that looks for messages that are both from me and to me, and that contain attachments. Those messages get a Files tag and are archived; this way, the Mail app on my iPad shows them neatly tucked into a folder with the same name. Good old FTP is another option for transferring files to and from your iPad. There are plenty of iPad FTP clients in the App Store, including FTP On The Go Pro ($7), FTP Deluxe HD ($1), and FTP Write ($5). These apps let you connect to a remote FTP server, and then edit the files stored there. 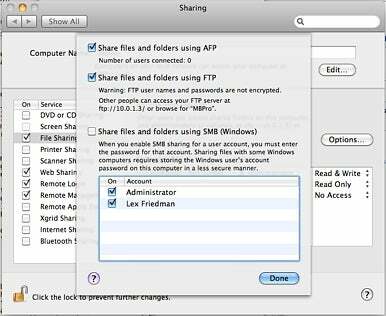 If you set up your Mac to share via FTP, you can send files to and from your iPad using an FTP app. If you have access to a remote FTP server (through your Web hosting company or other means), both your Mac and iPad can connect to it. But that means you’ll need to download files to your Mac whenever you want to work on them. You might instead choose to configure your Mac itself as an FTP server. To do so, go to the Sharing system preference and make sure that File Sharing is turned on. Then click the Options button and put a checkmark by Share Files and Folders Using FTP. System Preferences will then tell you the FTP address for your Mac. Note that, unless your home has a static IP address and your router is configured properly, it may be difficult (if not impossible) to connect to your Mac as an FTP server when your iPad isn’t on the same wireless network. Using FTP from the iPad can work, because it insures that you can work on just one copy a given file at any given time. But if you can’t get to your files when you’re online but out of the house, that’s a serious problem. Numerous apps—including iFlashDrive ($2), and Briefcase ($5)—let you use your iPad as a pseudo-thumbdrive, so that you can transfer files to and from the iPad. These apps and others like them can often connect to your Mac (if you enable file-sharing) over your local Wi-Fi network; some can connect by Bluetooth as well. A few of them even support remote access—including the ability to connect to SFTP servers. But this process still feels a lot like a wireless alternative to iTunes File Sharing: You can copy files back and forth, but must manage the process manually. The sad truth is that iPad file management is a chore. You can get a taste of what true, two-way, realtime sync would feel like when you use one of the many Dropbox-linked text editors available for the iPad. But the hodgepodge of file-syncing solutions available for other types of apps is a hassle unbefitting the iPad itself. Until Apple provides a better solution, I’ll rely on Dropbox text editors when possible, and use e-mail to shuttle other files back and forth. Updated on May 19, 2011: DropDAV now requires a $5 monthly fee.